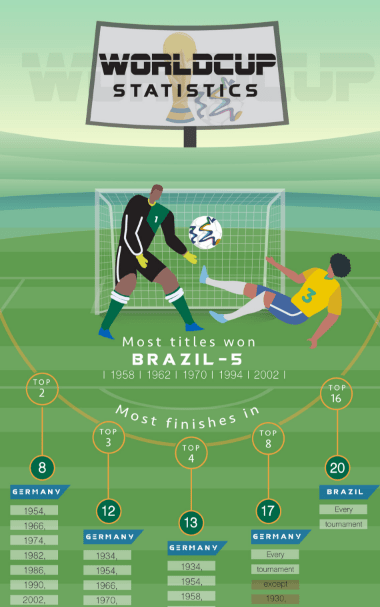 This infographic covers many interesting statistics about the football/soccer world cup. It includes interesting facts about the most successful and least successful teams, the most successful and least successful players and the most successful and least successful trainers. Apart from that includes also statistics about the referees and other interesting facts like oldest / youngest players e.t.c. For the curious, there is also information about the longest positive and negative streaks, the most finishes in 2nd, 3rd and 4th place, the longest gaps between successful titles, the best and worst performers during a world cup in their home country and also a lot of information about penalty shootouts. The last part of the graphic covers the biggest margins of victory and the most goals scored in a world cup match by one team or by both teams together. Another very interesting statistic is the largest deficit overcome in a win.